Back to Europe for the Eff Wun circus, which at least means we get to see it at sensible hours. According to my recalibrated sundial, the start should be at 7 p.m. but please check with your local TV feed. I would not like to be responsible for your missing the start. The question this meeting will be whether or not Japanese driver Takumo (take no prisoners) Sato will make it to the top step of the podium. Despite Ferrari appearing dominant at Indy, there are those who believe that Sato could have won, if it were not for poor strategy by the BAR pit. Now wise in hindsight, BAR team boss David Richards is admitting that the team got it wrong, and Ferrari got it right by bringing both cars in to refuel as soon as Ralf Schumacher had his accident and the Safety Car was deployed. BAR have finally agreed that they were wrong not to call their cars into the pits for fuel when the safety car was sent out. Sato and Button only pitted three laps after the safety car was called back in, dropping them to outside the top ten on rejoining, and was a decision which many observers felt cost the team any chance of victory. 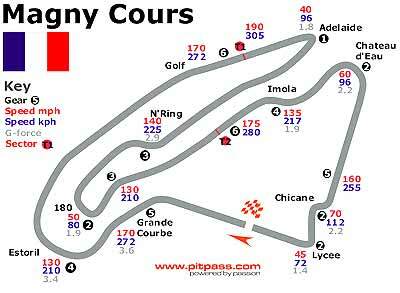 The Magny Cours Circuit has an interesting history. In the mid-eighties, an initiative by President Mitterand saw the Circuit Jean Behra near Nevers updated and modernised and renamed the Circuit Nevers Magny-Cours. The circuit had begun life as a small kart track, started by Magny-Cours’ mayor, Jean Bernigaud. The kart circuit grew into a proper track which was inaugurated on May 1, 1961; ten years later, it was lengthened from two kilometers to 3.85 km. In those ten years, Magny-Cours had become home to Tico Martini’s racing car company and France’s first race driving school. The decision in 1986 to upgrade the circuit to Grand Prix standards saw Guy Ligier move his Formula One team to the circuit and the new track was opened in 1989. Two years later, it hosted its first Grand Prix, and the French GP has remained there ever since. How much does it cost to run your car? The answer is a lot more than you actually think. For example, the Kia Rio is the cheapest car to run in Australia says the automobile authority in Victoria (RACV) and they estimate that this small car costs around 3,000 baht (AUD 100) per week. The RACV’s annual Driving Your Dollars survey analyses the running costs of the top selling cars in all market segments for private ownership. It factors in insurance, maintenance, registration, interest payments and depreciation costs as well as the cost of fuel, based on a five year ownership period and 15,000 km a year. While the Kia Rio took out the "light car" category, Toyota scored the most category wins. In the big cars, the 3 litre Toyota Camry took the honours at 5,000 baht per week, while in the medium cars, the Camry 2.4L won at 4,800 baht per week. The small car winner was the Toyota Corolla at just under 4,000 baht. The survey looks at all the items we prefer to ignore, such as insurance, maintenance, depreciation and interest. These are all hefty items. For example, a 2.4 litre Camry in this country will set you back around 600 baht per week, just for insurance. The most expensive vehicle to run in the RACV survey was also from the Toyota stable, the Landcruiser GXL six-cylinder turbo diesel 4.2L manual at over 8,000 baht per week. "The difference between the cheapest vehicle to run, the Kia Rio, and the most expensive, the Toyota Landcruiser GXL six-cylinder turbo diesel 4.2L manual, is about AUD 180 per week," RACV vehicles chief engineer Michael Case said. "In other words, you could run three Kia Rios for every Landcruiser." Needless to say, Kia were more than happy with the result, with Kia Australia managing director Ric Hull saying the company had been working hard to match the value-for-money purchase price of Kia products with the lowest possible ownership costs. "We have taken a sharp pencil to all the costs on which we can have an effect and these results show that our efforts have borne fruit," he said. With the keen competition between Toyota and Honda in this country, it would be interesting to see some (honest) comparison figures here too. Last week I wrote that 917’s were legendary vehicles, with some engines producing more than 1,500 BHP and performance figures such as 0-100 kph in 2.1 seconds, 0-160 kays in 3.9 seconds and 0-340 kays in 13 seconds in 1972. Some early 917’s were designated as 917 PA. The question was what did the letters PA stand for? This was simple - they stood for Porsche Audi. So to this week. Take a look at this photo. It was taken in 1959. The driver is Tony Brooks. What is the make of the car? Clue - the company is still producing road going vehicles today. 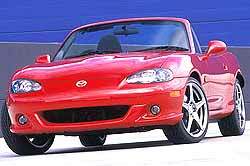 I have always liked the Mazda MX-5 series. I had one as my personal drive car for two years in Australia, and it never let me down in the 100,000 kays I racked up in that time. The only downside was a lack of grunt as the chassis/roadholding was just superb. I modified mine by lowering it slightly with beefier springs, free-flow exhaust and inlet systems, larger diameter wider wheels and low profile tyres. Since then, Mazda have done all this themselves, and now the version with the huffer and puffer has been released Down-under, and our man on the spot, John Weinthal has just finished a week of going Zoom-Zoom with the little red stormer. John describes the car as a serious contender for the enthusiast’s dollar. Here are the words from Weinthal. 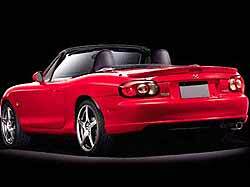 "Mazda’s seemingly everlasting MX-5 two seat convertible now has the option of an engine with the power enthusiast’s have always craved. "The MX-5 SE develops 121kW. That’s a 30 per cent boost thanks to intercooled turbocharging and substantial engine and other modifications to match its new urge. This 1122kg hotrod has the same power as the 1420kg Alfa Romeo Spider reviewed last week. It is 1kW less than the AUD 83,000 supercharged Mercedes SLK Kompressor which is more than 200 kg heavier than the AUD 47,500 Mazda. This is a serious competitor for the intelligent enthusiast’s dollar. "That assumes that the Mazda is a good car in itself - a more than satisfying drive, well built, reliable and, above all, good enough to weld a smile to your dial. It should also be practical and equipped with enough gear to lift it above the status of a car solely for masochists and Mazdaphiles. "A rain-free week in the Mazda showed that it meets all those criteria and then some. It was sheer joy. It has none of the quirks and compromises that make some of its ilk suitable, at best, as a second car. It even has heritage. It is little brother to the famed Mazda rotaries and is a product of the only Japanese company ever to win the Le Mans 24 hour race. "The MX-5 is strictly a two seater, but its two occupants have room to spare and can carry luggage for more than just a dirty weekend. The hood is the simplest and fastest to raise or lower should rain threaten or when security demands. It has none of the extra weight or power-sapping complication of a power hood. One simply undoes two clips and flips it back. To raise it the operation is reversed, rapidly and effort-free from the driver’s seat. The hood even has a heated glass window. "There are power windows and mirrors plus remote central locking but air-conditioning is a AUD 1950 option. Black leather seats add AUD 1000, however the standard black cloth with red inserts look more than sporty enough and are every bit as supportive. The MX-5 SE has two air bags, ABS anti-lock brakes, an engine immobiliser and excellent halogen headlamps. "The standard MX-5 develops 107kW and costs AUD 40,530 with a six-speed manual gearbox or AUD 42,000 for the marginally less powerful automatic model. There is no auto option for the MX-5 SE. "Apart from the turbo and associated mechanical upgrading which includes a limited slip differential, the Mx-5 SE has a six stacker CD player, body kit with front fog lights and other trim niceties. "But this is all detail - stuff you can learn from the brochure or in the showroom. The delight of any MX-5 is in the driving. Smiles are inevitable from congested shopping centre car parks to byways, freeways and your favourite twisty hill country. The super brisk turbo-charged SE surely enhances the experience. The chassis is brilliant. It is never fazed by the extra Zing - or, as Mazda would have it, Zoom. "My ONLY query concerns the terrific looking 17 inch five spoke wheels and 40 profile tyres. No doubt they contribute to the excellent handling and ultra-responsive steering but they also give a much firmer ride than the standard MX-5’s 45 profile 16 inchers. I have no comfort problem with the firmer ride, but I suspect the car might over a period. There is some body jarring which, with an open car particularly, may well lead to premature rattles and general loosening up. "Fuel consumption is largely up to the driver as always, but even more so with a turbocharged car. Thump it unnecessarily and you will not go as far on your 48 litre tank of premium unleaded. Driven for sensible fun this MX-5 SE will go up to 30 per cent further and still delight. "It makes you wonder why you would pay more for mid-range two-seater fun."